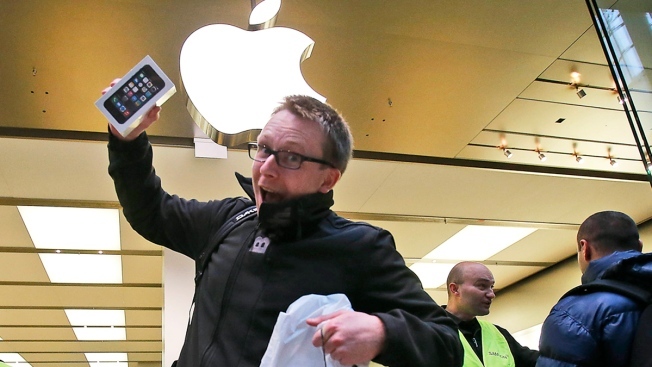 A customer of the Apple store in Oberhausen celebrates with the new iPhone 5S as he leaves the store at the start of the new iPhone sale in Oberhausen, Germany, Friday, Sept. 20, 2013. A poll by an Apple analyst reports that as many as 10 million Apple "iWatches" could be sold in its debut year, according to a report. A poll of 799 U.S. consumers conducted by investment firm Piper Jaffray found that 4 percent of iPhone owners would be early adopters of the wearable computer dubbed the Apple "iWatch", according to AppleInsider. That translates to approximately 5 to 10 million units sold in its debut year. Analyst Gene Munster, and noted Apple booster, wrote in the study that even with a penetration rate of 2 to 4 percent of iPhone owners, that would mean 5 to 10 million sales. "While we do not view the watch as a likely needle-mover for Apple in terms of revenue in 2014, we put it in a similar category as the television in that it could demonstrate Apple’s ability to innovate (good for the multiple) and potentially lead to a more meaningful new product category in wearable tech," Munster wrote. If 7.5 million were sold in the first year at $350 each (and 30 percent profit margin) it could mean $2.6 billion in revenue and $790 million in profit for Apple, according to AppleInsider. However, with the "iWatch" priced at $350, 88 percent of survey respondents said they would not be interested in purchasing the wearable computer at that price. The new wristwatch computer hasn't even been confirmed by Apple, yet it's expected to launch the device next year with a potentially 2-inch touchscreen. It seems as if the tough part for Apple is finding a price that makes it attractive enough for customers other than early-adopters.